1915-2015 Panama Pacific International Exposition centennial medal, copper. 1915-2015 Panama Pacific International Exposition centennial medal, brass. 1915-2015 Panama Pacific International Exposition centennial medal, silver. 1813-2013 Battle of Lake Erie & Perry Bicentennial medal, struck on 1879-1921 Morgan Silver Dollar. NOT endorsed by US Mint. 1813-2013 Battle of Lake Erie & Perry Bicentennial medal, struck on US Mint 3-inch 5-troy-oz 999 silver Perry's Victory. NOT endorsed by US Mint. 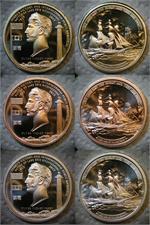 1914-2014 Panama Canal centennial medal, brass. 1914-2014 Panama Canal centennial medal, copper. 1914-2014 Panama Canal centennial medal, silver. Set of three 1813-2013 Battle of Lake Erie & Perry Victory Bicentennial medals, proof-like, brass, copper, and silver. 1813-2013 Battle of Lake Erie & Perry Victory Bicentennial medal, brass. 1813-2013 Battle of Lake Erie & Perry Victory Bicentennial medal, copper. 1813-2013 Battle of Lake Erie & Perry Victory Bicentennial medal, silver.